But this leaves a further question: Even if we can believe in a Bible that is the word of God, though some of its observations are not accurate by modern standards, how can we tell what parts of the Bible reflect accurate knowledge, and what parts don’t? It would be just as big a mistake to say, “If it isn’t all correct, then none of it is correct” as it would be to say, “If it’s going to be the word of God, then all of it has to be correct.” All-or-nothing thinking rarely leads us to the truth, which we typically find nestled in a more elusive and nuanced place. If the Bible was written by people working under the same human limitations as the rest of us, then the Bible itself, by definition, cannot contain or provide criteria by which we can determine which things in it reflect accurate knowledge and which things don’t. That’s still expecting omniscience of it, in a certain way. Rather, we should recognize once again that while the Bible is the supreme authority for the Christian, all Christians (whether explicitly or only tacitly) rely on other authorities to support the Bible, specifically tradition (church teaching), reason and experience. We can and must use these external authorities to assess biblical statements. For example, if we include under “reason” all scientific enterprise, then the discovery that the solar system is heliocentric, not geocentric, reveals that biblical descriptions of a stationary earth and moving sun are not “accurate” in an objective sense. This same process can lead us to all kinds of interesting discoveries about the geography, climatology, medicine, etc. of the Bible, and we may find many things we feel we can helpfully update. But eventually we will reach the limits of this process, without having addressed everything in the Bible. In fact, we will not have addressed the most important things in it, because what the Bible is most concerned with are those things that are not accessible to scientific investigation. If there is indeed an invisible spiritual world, we have no means of verifying what the Bible says about it through science. We could assume that there is no such world, but that would be a faith stance, as much as to believe that there is such a world. We can argue that if the biblical authors were wrong about so much in the natural world around them, they must also have been equally wrong about much in the supernatural world, but this is not really logical. It presumes that we have access to the supernatural world through the same faculties that give us access to the natural world—a claim we have already seen not to be true—or else it presumes that the human race is somehow in a better position now to make use of the faculties that do give access to the supernatural realm than people were in biblical times, which is by no means obvious. At its core the Bible is a story of relationships. It is a story of relationships of faith and trust that people enter into with God and with one another (“covenants”). And the world of relationships is one that we have access to freely, even if our knowledge of the natural world is limited to what we can discover through naïve observation. The capacity for faith, through which we enter into relationship with God, is not one that human civilization has slowly cultivated and perfected over time. Faith is something every human has always capable of, just as every human, in every age, has had the potential to love. We would not assert that the love described in the Bible was somehow defective compared with our own because it took place in a primitive culture, and we should not make the same assertion about the faith described in the Bible, either. While the human authors of the Bible would have had limitations when it came to their knowledge of the natural world, they would not necessarily have had similar limitations when it came to knowing God, relationally and experientially. The characteristics of the Bible that show it to be time-bound and culture-bound even as it discloses universal principles are its marks of authenticity. This book was not made up in a corner; it’s a travel diary, written on the road. That road is still open to all of its readers today, to all who will join in the same adventure of faith that its authors embarked upon. This faith is not hostile to reason or to science. Rather, it can and must work with them to show us the nature of our world and the meaning and purpose of our lives. We should note that while this question seems similar to the one we addressed in some earlier posts, it is actually different. The question there, asked in the contest of the larger question, “What is the basis of our confidence in the Bible’s moral authority?” was whether we could establish that the Bible is the word of God by appeal to the uncannily prescient information its authors supposedly had about the inner workings of the universe. We have seen once more in these most recent posts that they did not actually possess such information. That is, the Genesis author specifically does not demonstrate knowledge far beyond what he could have had in the time and culture in which he lived. Like his contemporaries, he had little idea how vast and complex the universe actually is. He wrote from the perspective of an earth-bound observer. So we cannot ground our confidence in the Bible as the word of God in his observations. That confidence comes rather from the supporting authorities of tradition, reason and experience, as we established earlier. Because the Bible is scientifically accurate, it’s the word of God. Because the Bible is the word of God, it’s scientifically accurate. But is this a reasonable expectation to have of the Bible? What is a fair test to apply? It is really only fair to judge the Bible by the standard it sets for itself. If the Bible did seek to ground its own identity as the word of God in an omniscient knowledge base, there would be a real problem. But the Bible rather describes itself as having been delivered through human authors. The implication is that while the author may have been given wisdom and insight, the human limitations on his knowledge were not supernaturally lifted. 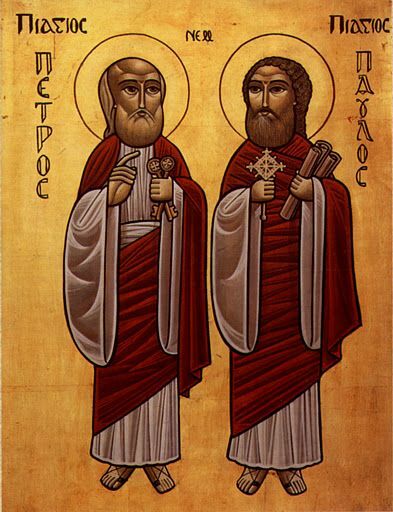 A Coptic icon of the apostles Peter and Paul. The two are often shown together in Christian icons to illustrate the harmony of their lives and teachings. “For we know only in part, we prophecy only in part; but when the complete comes, the partial will come to an end. . . . For now we see in a mirror, dimly, but then we will see face to face. Now I know only in part; then I will know fully, even as I have been fully known” (1 Cor. 13:9-10, 12). “Now I know only in part.” Fine words for an inspired biblical author to utter, if the expectation of omniscience is warranted! But what we see here in this passage is rather that this expectation is not warranted. We see a biblical author, in the very act of writing Scripture, contrasting his partial knowledge with the divine omniscience. We should therefore not conclude that if the Bible is the word of God, it will demonstrate omniscience—among other ways, by transcending observational limits in its description of the natural world—and that if it does not, it cannot be the word of God. So even if we are comfortable with the idea that the Bible can be the word of God even if its descriptions are observational, it may still bother us that the authors didn’t know that the cosmos isn’t actually as it appears. They weren’t writing from the position: “We don’t know what it’s really like, so we’ll just tell you what it looks like” (intentional phenomenology). They thought it really was like what it looked like (unintentional phenomenology), and in this respect they were wrong. So how can this be the word of God? We may simply reply that if the authors of the Bible really had known what they didn’t know, then the human limitations on their knowledge actually would have been lifted. Ordinarily humans hold some beliefs uncertainly and others with certainty, but they are almost always wrong about some of the things they feel certain of. Moreover, they discover in their lifetimes that some of the things they thought were correct weren’t, but there are other things they go through their entire lives believing to be correct that only later generations will discover to have been inaccurate. To expect the biblical authors to have had this perspective of later generations is once again expecting them to have been uncannily prescient. If you know everything, you’re omniscient; and if you know exactly what you do know and exactly what you don’t know, that’s also being omniscient, in another sense. But as we have already noted, the Bible itself does not ascribe omniscience to its authors, and this would be true in either sense. They were rather people who were “moved by the Spirit,” who received wisdom and insight from God. So not only didn’t they know everything, they didn’t know what they didn’t know. There were some things they thought to be correct that weren’t. This conclusion is consistent with the Bible’s own description of its composition process. Once we recognize that the Genesis cosmology reflects what we have called, without prejudice, a “naïve” observational perspective, we are in a position to compare that cosmology with others that have been articulated throughout the centuries. To begin with, we may instructively contrast it with the cosmology that Aristotle articulated in the fourth century B.C. We must acknowledge that the Aristotelian cosmology displays a level of complexity significantly beyond that of Genesis, in that it recognizes, for example, the existence of planets that are distinct from stars. Moreover, the Aristotelian cosmology correctly recognizes that there are no “waters above” the sky and that the sun, moon, and stars don’t move below the sky. Nevertheless, a modern observer making even a casual inspection of the Aristotelian cosmology will immediately spot one of its gravest flaws – its geocentric view of the universe. Nicolaus Copernicus improved on both the biblical and the Aristotelian cosmologies in the sixteenth century A.D. by correctly recognizing that the sun occupies the center of our solar system. However, there were also flaws in the Copernican system, such as the assumption (really made on theological grounds) that the planetary orbits had to be circular. This was corrected by Johannes Kepler, who deduced that planetary orbits were elliptical. Further breakthrough insights into cosmology were achieved by Newton in the seventeenth century and Einstein in the twentieth, with countless other scientists filling in important pieces along the way. The planet Neptune as photographed by Voyager 2 from about four million miles away. When the planet Uranus was discovered, deviations in its orbit from what Newton’s gravitational laws would have anticipated allowed scientists to predict the existence, mass and position of another planet beyond it. The same night that this theoretical prediction reached the Berlin Observatory, astronomers there found Neptune, within one degree of its expected position. But despite its explanatory and predictive power, Newton’s cosmology has since been eclipsed (so to speak). The history of cosmology has thus seen paradigms continually refined and even overthrown at intervals, as observation, measurement and analysis have steadily increased in accuracy. Yesterday’s cosmology is not today’s, nor is today’s likely to be tomorrow’s. Nevertheless, significantly, with all of the refinements that have been introduced and all of the overthrows that have occurred, scientists have never returned to an older cosmology when flaws have been demonstrated in an existing one. Rather, newly synthesized and conceived models have always proven to explain the data in more satisfying ways. So here is the question: As a scientist, even if you are also a believing Christian, which cosmology would you prefer to use as a springboard for your quest to understand the origin and nature of the universe and the origin and diversity of life on this planet? The naïve observational cosmology of Genesis, with its solid sky, “waters above,” pushed-back seas and light without the sun? The geocentric Aristotelian cosmology? That of Copernicus, with its perfectly circular planetary orbits? Some other older cosmology? Or our present understanding of the nature and structure of the Universe, which, while admittedly still subject to refinement, nevertheless incorporates all of the objective observations and measurements made over the centuries into a reasonable working model? We doubt that any of our readers would want to begin their scientific investigations in any field with the premise that the earth is flat and the sky is a solid dome above it. As Christians, we are not obligated to try to put new wine into old wineskins. There is nothing to be gained by trying to force all of the information that is now available to us about the nature of the universe into a world view that must by now be recognized as phenomenological (i.e. observational). One way to summarize our argument is this: If you feel that you must believe in a young earth on the basis of a commitment to a literal reading of Genesis, you must also believe in a flat earth on that same basis. But if, as is no doubt the case, you do not feel that you have to believe in a flat earth, even though it has now been shown that this is what Genesis literally presents, then you may already have articulated for yourself the reasons why you don’t need to believe in a young earth, either. This certainly does not have to be your starting point. You are free to let the data speak for itself. “It is the glory of God to conceal a matter; it is the glory of kings to search out a matter” (Proverbs 25:2). King Solomon, who wrote these words, was noted for his natural-scientific investigations: “He described plant life, from the cedar of Lebanon to the hyssop that grows out of walls. He also taught about animals and birds, reptiles and fish” (1 Kings 4:33). In these days when many of us enjoy the kind of leisure for cultural, artistic and scientific pursuits that only kings formerly enjoyed, we may paraphrase Solomon’s words in this way: “God has hidden countless fascinating and wonderful things in his creation, and he wants us to delight in discovering them.” When we do, we bring God pleasure by fulfilling his purposes. So all those who are called to scientific enterprise should pursue that calling without fear or doubt, but rather with joy and enthusiasm. There is no script that you need to follow, no predetermined conclusion that your results need to square with. If there were, God would not really have “hidden” these treasures for us to find. They’re out there—go get them! And God said, “Let there be lights in the expanse of the sky to separate the day from the night, and let them serve as signs to mark seasons and days and years, and let them be lights in the expanse of the sky to give light on the earth.” And it was so. God made two great lights-the greater light to govern the day and the lesser light to govern the night. He also made the stars. God set them in the expanse of the sky to give light on the earth, to govern the day and the night, and to separate light from darkness. (Genesis 1:14-18). When we reach this fourth day of creation, if we have been reading in sympathy with the naïve observational perspective of the author, we are no longer troubled by what we described earlier in this book as a “very good question.” We will no longer wonder how there could have been light on the earth starting from the first day, if the sun was only made on the fourth day. Instead, we will find here confirmation that the “light” created on the first day was not understood to be the light of the sun, but rather the light that appears in the sky each day with or without the sun. Indeed, the sun is not described here as the source of all the light in the sky, including (as we would understand today) the light of the moon. Rather, the sun is believed to have more limited functions: With the moon, it “separates” the day from the night; it allows people to mark the passage of time and to establish fixed times; and it gives light on the earth. The second and third functions are relatively easy to understand from the author’s perspective. Before clocks and calendars, months were marked off by the phases of the moon, and a year’s circuit by the sun’s return to a given inclination above the horizon. A time and date for a meeting could be set by the height of the sun in the sky and by the shape of the moon. The earth is much more brightly illuminated when the sun appears, even though there is always light during the day. But what did the author have in mind when he said that the sun and the moon would “divide the day from the night” (v. 14) or “the light from the darkness” (v. 18)? “Division” or “separation” into realms is the basic principle of creation in this account; the dome “separates” the waters above from the waters below (vv. 6-7), and God distinguishes the light by “dividing” it from the darkness (v. 4). But what further do the sun and moon add to this accomplishment? We might say that the sun keeps the darkness from encroaching on the light by ensuring that it is always light during the day, but this explanation breaks down when we consider conversely that (1) the moon does not, for its part, maintain the night in a state of darkness and (2) it does not even stay within the realm of night. That is, we often see the moon in the daylight sky. Put another way, the time-realm of the sun and the time-realm of the moon are not synchronized so as to remain mutually exclusive. We may picture either the sun encroaching on the moon’s realm, or the moon encroaching on the sun’s realm, but either way, even if we begin observation at a point when the two are distinct, eventually we will see them become concurrent and then diverge again, over and over. If it is nevertheless intended that the sun and moon “divide” the day and night by marking those time periods, respectively, by their presence, then the best we can say is that we do tend to notice the sun during the day and the moon during the night, and thus to think of day as “sun-time” and of night as “moon-time.” These associations, in fact, fill popular verse and song to such an extent that we must admit that the sun and the moon do, in our collective imagination, mark and distinguish day and night. But these are not the only ways in which the account of the fourth day confounds our modern cosmological expectations. Perhaps even more important is the effect of a small preposition: “in.” Genesis tells us that God set the sun, moon and stars in the dome of the sky (vv. 14, 15, 17). We today would instead place them beyond the sky – outside our atmosphere. Even if we grasp the idea that the Genesis author is picturing a solid sky, we might still imagine these lights shining through from the back. But the account says quite clearly that they are in the dome. The particular means by which they are attached is not specified; nor is the means by which they move through the sky. But there can be no doubt about where they are, and it is not where modern cosmology would put them. Nevertheless, it is exactly where they appear to be, to the naïve observer. With the sun, moon and stars in place above the earth, the cosmic superstructure is complete. And so our exercise does not require us to go farther than this fourth day. (But illustrations of the remaining two “work days” of creation will be shown below, to complete the picture.) Indeed, we should recognize that from the author’s perspective, the superstructure was actually complete after the third day, once the division into realms had been completed: day and night; sky and sea; sea and land. The heavenly luminaries, like the creatures of the fifth and sixth days, actually populate realms already marked out. It is only because we now think in terms of a “solar system” that we consider the sun and moon with the interest of an architect, rather than that of an interior decorator deciding on track lighting! By now we should realize that Genesis, when understood as originally intended, does not present an objective scientific account of the origins of the universe. It rather presents a phenomenological account—that is, it describes how things appear and how they appear to have been made. We may now proceed to consider the implications of this realization, first for the scientist, and then for students of the Bible. The fifth day of creation: Birds fly in the sky and fish swim in the sea. The sixth day of creation: Animals and humans populate the land. And God said, “Let the water under the sky be gathered to one place, and let dry ground appear.” And it was so. God called the dry ground “land,” and the gathered waters he called “seas” (Genesis 1:9-10). When, from the perspective of our modern cosmology, we picture land emerging from the sea, we understand this to occur by the land increasing in elevation. An undersea volcano will eventually form an island, for example, if it grows high enough. The process is driven by gravity: Water flows downhill, and so if the hill is high enough, with a sufficiently large catch-basin at the bottom, the top will be dry. But the Genesis account does not appeal to gravity. That is, it says neither that the land was raised, nor that the sea was made deeper. The waters were simply “gathered together”—pushed to one side, out of the way. The proper analogy to draw is to something that happens when one is making a white sauce in a large flat skillet. Once it thickens, it can be pushed to one side with a swift movement of the spatula, momentarily revealing the dry bottom of the pan. The only difference is, in the Genesis account, the waters stay put when moved aside. Other Old Testament accounts of creation confirm this understanding. Psalm 33:6-7 says, for example, “By the word of the Lord were the heavens made, their starry host by the breath of his mouth. He gathers the waters of the sea as into a heap; he puts the deep into storehouses.” (This is an alternative translation that the NIV suggests in a footnote; it’s cited here to show the parallel with the Old Testament passages cited next, which use the same term.) The “heap” in question truly is a wall of water. This is seen clearly from Exodus 15:8 and Psalm 78:13, where the term describes how the Red Sea parted to allow the Israelites to pass through, and Joshua 3:13 and 16, where it describes how the Jordan River’s upstream flow heaped up to allow the Israelites to enter the promised land. God thus commands the waters into what is, to us, a gravity-defying position, not just temporarily at the time of the exodus and conquest, but durably at creation itself. And when he marked out the foundations of the earth. (Prov. 8:27-29). This is another case in which we can share the phenomenological viewpoint of the Genesis author through intentional naïve observation. If we take a walk by the seashore, we will recognize that the waters indeed appear to be higher than the earth (an optical illusion that results from a distortion of perspective), as if they had been pushed back off its surface. And the tides and waves that arise incessantly appear to be waters trying to reclaim the earth. But each time, they retreat back to within their boundaries. The idea of waters being pushed back into a pile at the edge of the land does not square with what we understand about gravity, but if we can nevertheless grasp the notion in our minds, we will be well on our way to appreciating the observational perspective from which the Genesis creation account is actually written. Only when we achieve such an appreciation can we understand the implications for us today of the fact that the passage is written from this perspective. When we take these statements literally—as it has often proven difficult for literally-minded interpreters to do—they have profound cosmological implications. According to the Genesis account, God’s creative activity on the second day consisted of inserting a hollow, but solid, dome-shaped object in the midst of the waters, with the result that some of the waters were then “below” this dome while the rest were “above” it. The Hebrew word for this object is raqiya, derived from a verb meaning “to spread out” or “to beat thin” (as one might do with metal). The picture is of a tent being stretched out on poles, or of metal being poured or pounded into the shape of a dome. This was the Hebrew understanding of how God had made the sky. Thus Elihu challenged Job, “Can you join God in spreading out the skies, hard as a mirror of cast bronze?” (Job 37:18). Several other Old Testament writers similarly refer to God “stretching out” the sky (Psalm 104:2, “like a tent”; Isaiah 40:22, “like a canopy”; Jer. 10:12, Zech. 12:1). Further evidence that ancient peoples understood the sky to be solid may be found in the account of the Tower of Babel, whose builders expressed the expectation that they could build right up to the dome (Gen. 11:4). A solid sky is already one significant departure from our modern cosmology. But there is another: The author of Genesis clearly believed that there was a quantity of liquid water above this solid sky. From the text, there is no reason to conclude that these “waters above” were in any way different from the “waters below” (the seas). In other words, the Genesis author is not describing water vapor or clouds, as a modern reader might surmise. Those would be waters in the sky (or more literally before the face of the sky, i.e. just this side of the dome, which is where the birds are said to fly in Gen. 1:20). This account instead describes waters above the sky, which we should understand as the “seas above,” that is, the remnants of the primordial watery chaos. As the book of Genesis continues, we discover that some time after the creation, these “waters above” are called upon to serve God’s further purposes. Wickedness has spread pervasively among all of the creatures on the land, and God has determined that He must destroy the creatures by destroying the land on which they live, in order to restrain this wickedness (Gen. 6:13). To generate the flood that swamps the dry land, God opens the “windows of the sky” (Gen. 7:11, 8:2) and lets the “seas above” flow through the dome on to the dry land. We may rather understand it by analogy to the floor grates built into old houses that were heated by basement coal furnaces. The furnace would heat the air of the entire basement and the floor grates were then opened to let this warm air rise throughout the house. But perhaps the best analogy we can draw is to the floodgates built into dams that allow water backed up behind the dam to be sent downstream, either for irrigation or to keep the dam from overflowing. The “windows of the sky” in Genesis 7:11 and 8:12 are literally “floodgates” that allow the “seas above” to flow through when opened. The vision of the second day of creation, therefore, is of a hollow but solid dome with seas beneath and above. To think of the “firmament” or “expanse” of the sky as a gaseous atmosphere is to read our present understanding anachronistically back into an ancient text.